Jake Geismar worked as a reporter in Berlin up until the autumn of 1941. He then worked in North Africa and Italy before working his way into Germany with General Patton’s army, visiting a couple of death camps. Before leaving Germany he vowed to Lena, a work colleague with whom he was having an affair, that he would return after the war so they could resume their relationship. But flying into the shattered ruins of Berlin to cover the meeting of Churchill, Truman and Stalin, and to report on the city, its inhabitants and political division and administration for Collier’s Magazine, he’s worried that she hasn’t survived the war. He soon has other stories to keep him occupied – a US soldier that shared his flight is found murdered with a stash of money, a congressman keen to snap up German scientists for the US, the uncovering of Nazi war criminals who are seeking to make their past disappear, and allied soldiers on the make in a thriving black market. Geismar is determined to find Lena and get to the bottom of each of these issues, particular the death of the US soldier, but the more he digs, the more complicated and interwoven the stories become and the more danger he finds himself in. The Good German has the feel of a Hollywood movie, blending a romance story with that of a thriller, accompanied by strong undercurrents of justice and morality during and after war – he’s a US reporter and she’s the German wife of a rocket scientist who’ve been separated by the conflict; he’s now searching for her at the same time as pursuing the biggest story of his career, one that puts them both in great danger. It’s a tale that seeks to be a mainstream romantic thriller, whilst also covering big themes such as war crimes and the Allies conflicting positions on how to deal with Germany and its people in the immediate aftermath of the war and the tensions and manoeuvring between them. Kanon manages to skilfully mix the style and substance, providing two long intersecting story arcs focused on Jake and Lena’s romance and the murder mystery with respect to the death of a US soldier, whilst also delivering a number of interesting subplots. The characterisation, historical contextualisation and sense of place and time are very good throughout. The writing and plotting is assured and engaging, though sometimes is a little longwinded and melodramatic, and the interconnection of all subplots is overly convenient and contrived. 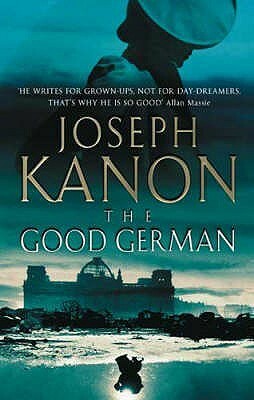 Nonetheless, The Good German is a compelling, atmospheric page-turner and thought-provoking read. It's the romance aspect that's always made me shy away from this book, though the rest seems of interest.